Megafauna and Changing Grasslands in Australia | Planet-TECH Associates: Trends. Innovations. Opportunities. Agriculture, the “science, art, or occupation concerned with cultivating land, raising crops, and feeding, breeding, and raising livestock” marks perhaps the most fundamental of all interactions between man and nature. Agriculture is the chief way Australia produces food, drink, and clothing from natural resources. This huge industry is an essential part of the lives of each and every Aussie man and woman. However, in recent history, respect and understanding of the land has dwindled, and modern agriculture has come to represent disharmony between man and nature. This can be seen through the intense changes to land Australia has seen in the last couple centuries. With the introduction of white settlers and foreign animals, including the rabbit, the native grasslands fell under attack. Settlers introduced the concepts of ploughing fields, over-grazing the land with domesticated animals, and cultivating European grasses in Australia. It is not difficult to imagine the detrimental nature these practices have had on the native grasslands of Australia. However, what many people do not realize is that the natural environment of Australia began to change long before the introduction of intensive modern agriculture. Increasing evidence is showing that the extinction of megafauna causes major changes to grasslands in Australia. Megafauna once played an essential role in the health and survival of grasslands. This understanding is explored by Tim Flannery, Chief Commissioner of the Australian Climate Comission. According to Flannery’s book The Future Eaters, 95% of Australia’s native megafauna are extinct. About 100,000 years ago, more than 50 species of medium to large herbivorous marsupials roamed the land. The tree feller, marsupial rhino, giant rat kangaroo, marsupial lion, and dwarfed marsupials are all examples of herbivores that are now extinct. The grazing of these animals helped “[maintain] a complex vegetational mosaic which supported all of [the herbivores] and allowed a diversity of plants to coexist”. According to Flannery, the dung produced by these herbivores functioned as a vital fertilizer for the soil. Dung beetles, which are now extinct, consumed and buried the dung. By this process, plants received recycled nutrients quickly. This was a fundamental strategy in Australian grasslands and soils because “even though the soil may be relatively poor, the rapid turnover of nutrients compensates”. Thus, argues Flannery, herbivores were essential to the life and vitality of the grasslands. This understanding of the linkages between megafauna and healthy grasslands has been gaining popularity and exposure. A study was published in Science on March 23, 2012 titled The Aftermath of Megafaunal Extinction: Ecosystem Transformation in Pleistocene Australia. This study discusses evidence that the extinction of megafauna led to changes in the Australian ecosystem. Sporomiella spores disappeared around 41,000 years ago, about the time that humans first colonized Australia. The time of the disappearance of the fungus, found mostly in the dung of large herbivores, marks the extinction of megafauna. At the time of the extinction, sediment cores from Lynch’s Crater show that there was no climate change event occurring at the time of megafauna extinction. About 100 years after the extinction there was an increase in fire activity, as well as a transition from rainforest species to grasses and leathery, dry-tolerant vegetation. Thus, these changes in vegetation appear to have arisen as a result of the loss of large herbivores. According to the study, humans hunted the megafauna to extinction. The loss of grazing of the megafauna then brought about changes to the vegetation, soil, and ecoysystem. These discussions are essential to the concept and understanding of Holistic Management. In the lands around the world being recovered through a Holistic Management approach we have seen that domestic, sedentary livestock has negative consequences on the land. 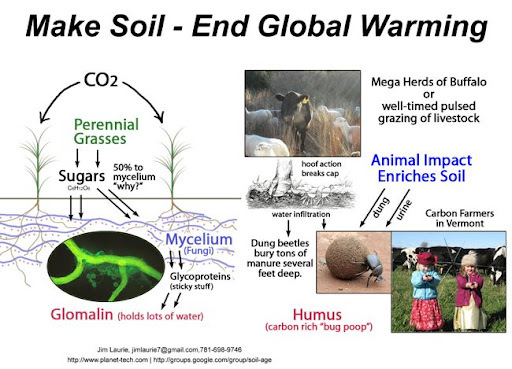 Over-grazing leads to desertified soils. However, this does not mean that all grazing is bad. Properly managed grazing techniques that mimic the patterns of migrations of now extinct megafauna can help revive soils and bring back fertility in the most surprising ways. The incredibly dry soils of Australia are no exception.